I still get excited and happy to see a rainbow after rains as I used to during my childhood. The colors of rainbow in a soap bubble or in the splashing water of a gigantic waterfall or up in the sky....rainbow is always magical. 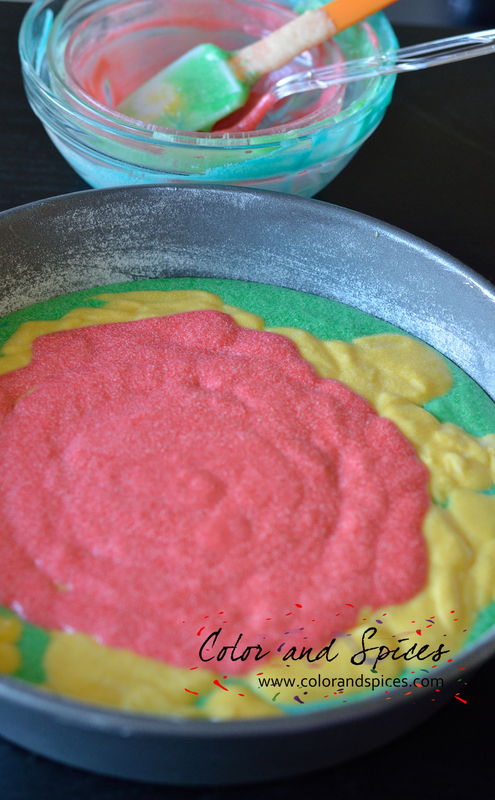 So when I saw a multi-colored cake with swirling colors, I decided immediately to bake one for my little angel. 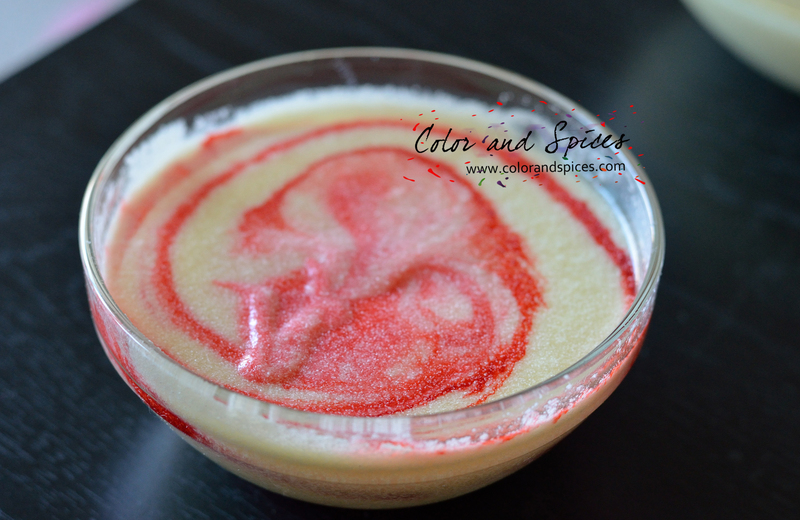 Thanks to Indrani boudi and Subrata da for the idea and recipe. 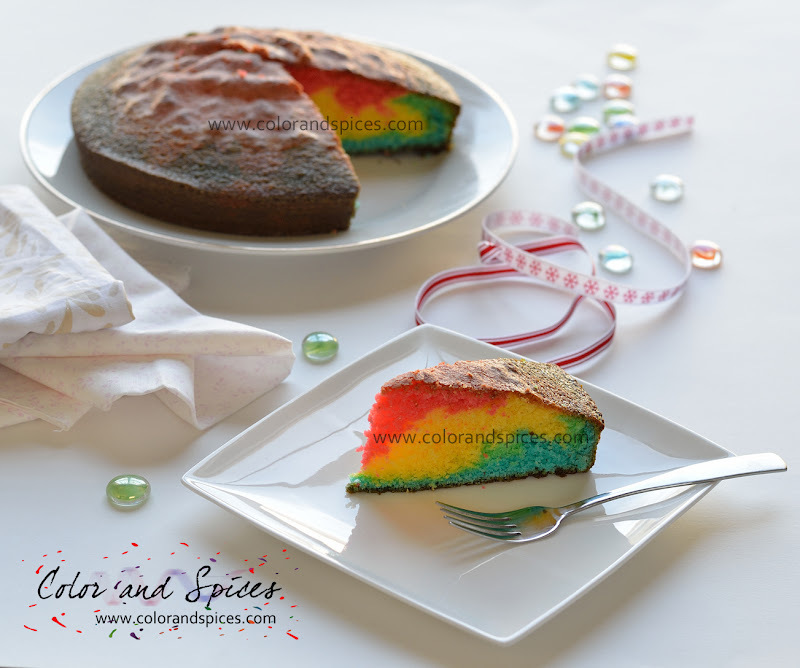 The cake is very easy and simple. It is a vanilla flavored yellow cake, that most of us bake at home. 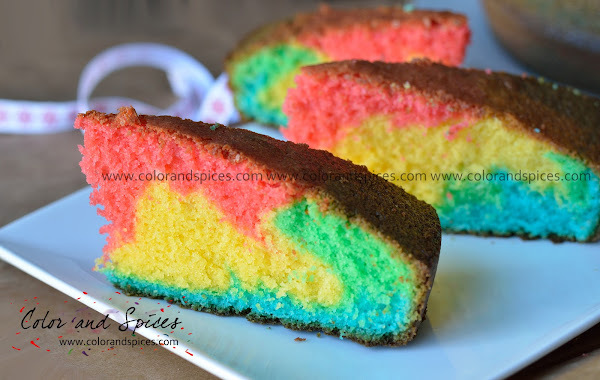 I added some color to the batter and layered it to get this rainbow look. 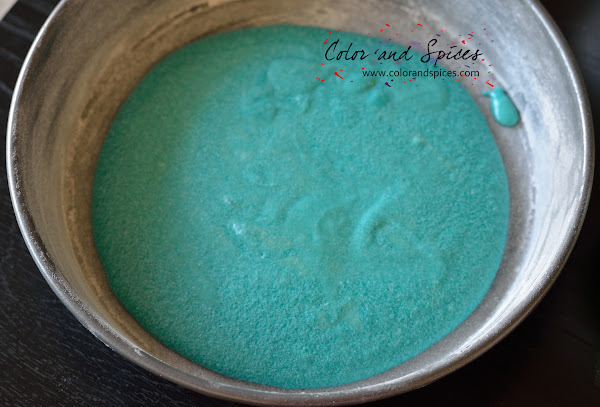 Instead of making the cake from scratch you can always use store bought cake mix. This cake is a very good choice for a kids birthday party. You can also make cupcakes out of it. I must confess, I do not usually like to use food colors and avoid as much as possible. 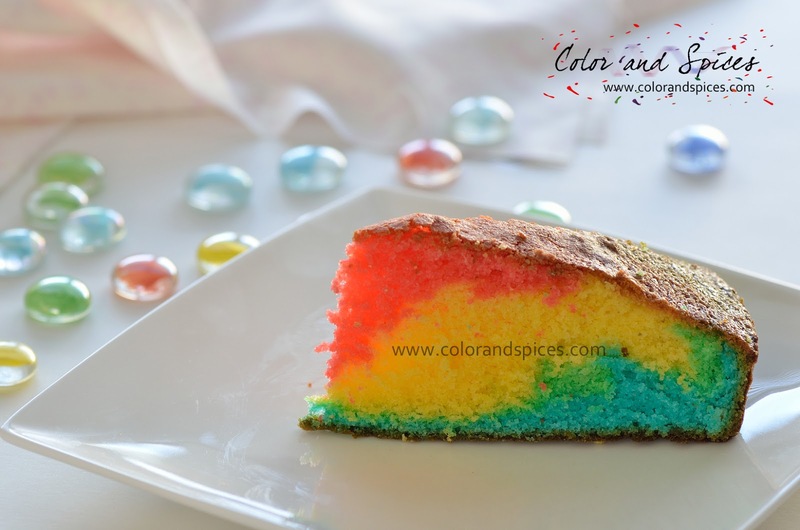 As this colorful cake is generally made for kids, choose branded food color, preferably organic one. 1. Preheat oven at 375 F.
2. If you are making the cake from scratch then bring all the ingredients to room temperature. 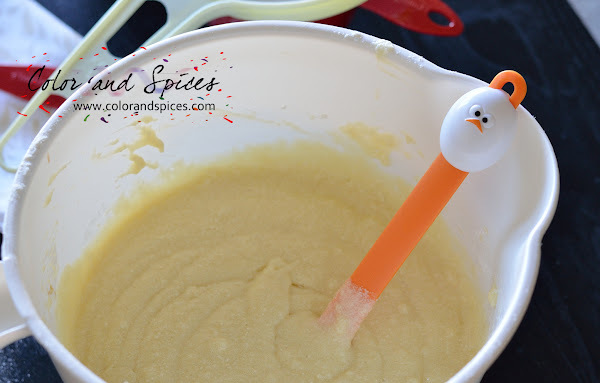 I used a hand mixer to make the cake batter. 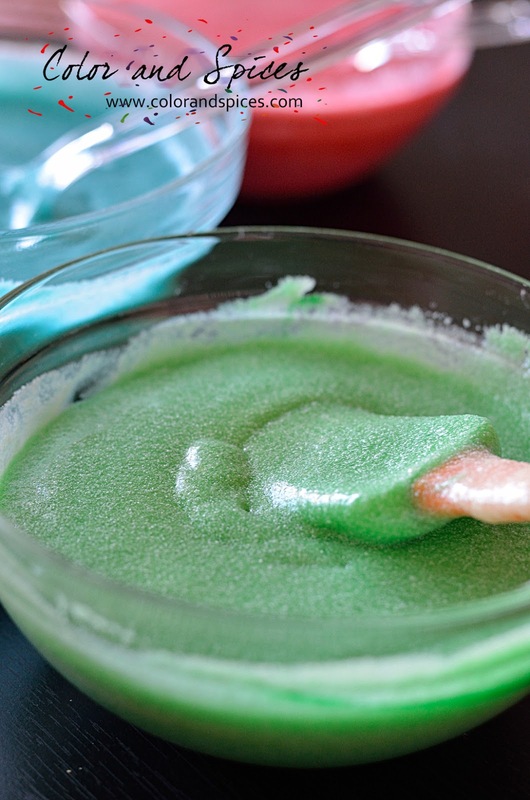 You can use a stand mixer also, whatever available to you. 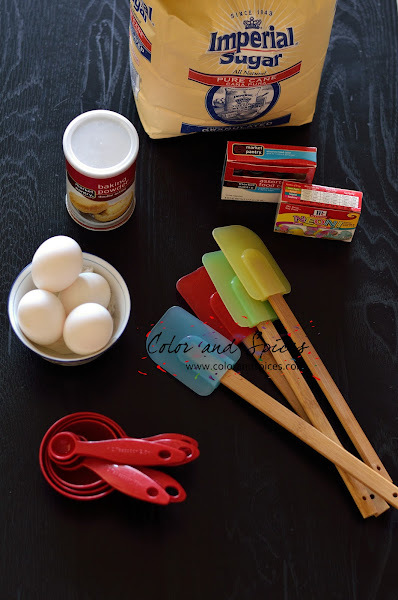 As I said you can use store bought cake mix, in that case follow the instructions on the box. 3. 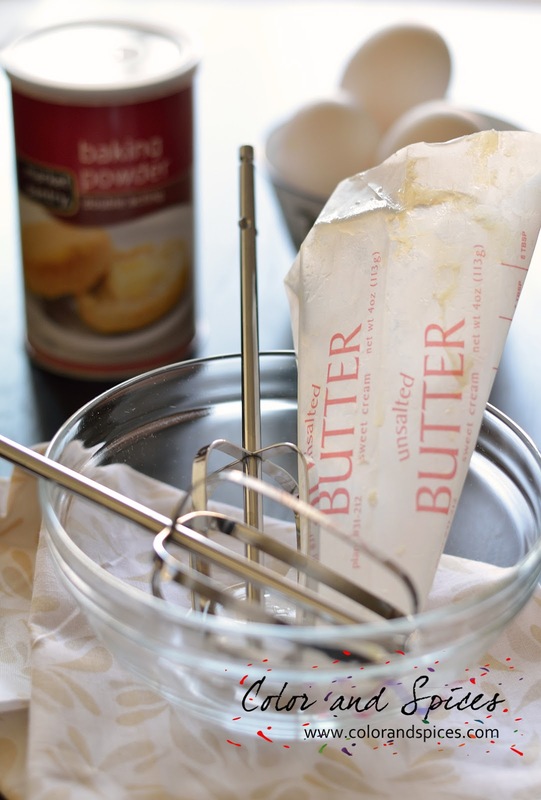 Take unsalted butter and granulated sugar in a large bowl and whisk on high speed till the mixture becomes creamy. 4. Crack the eggs in a small bowl. Add one at a time to the butter-sugar mixture and mix well. Add milk and mix well. 5. Add pure vanilla extract. 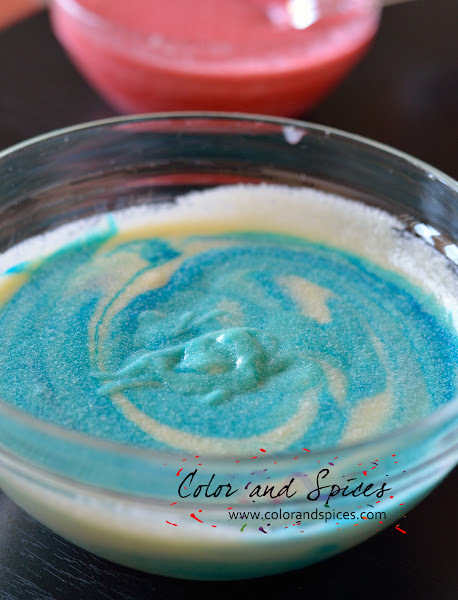 Try to use vanilla extract, not essence. Mix well. 6. 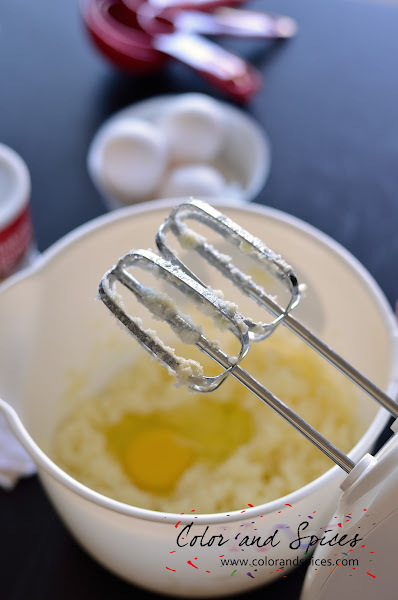 Take flour, baking powder and salt and sieve it into the sugar-butter-egg mixture. 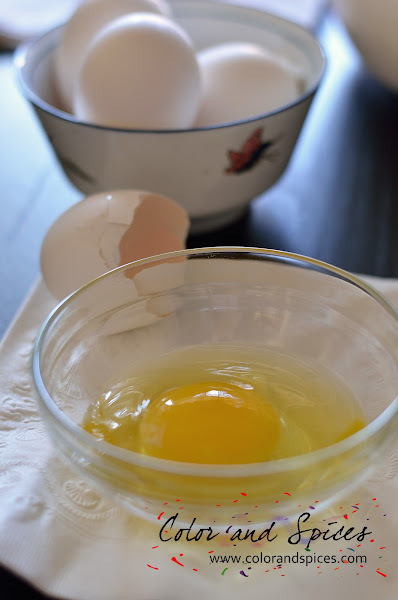 Add gradually and fold with a spatula. 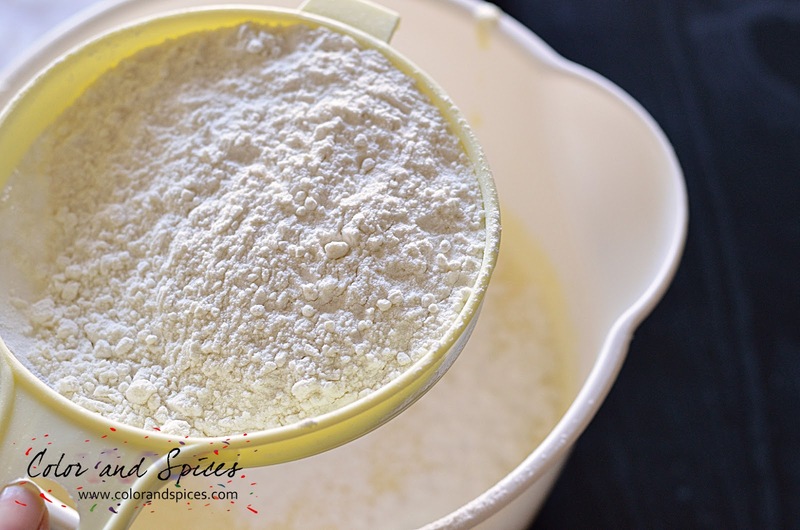 To fold means to add the flour gradually(not all the flour at a time), and gently mixing it with other ingredients with a spatula or large ladle in a horizontal sweeping motion. 7. 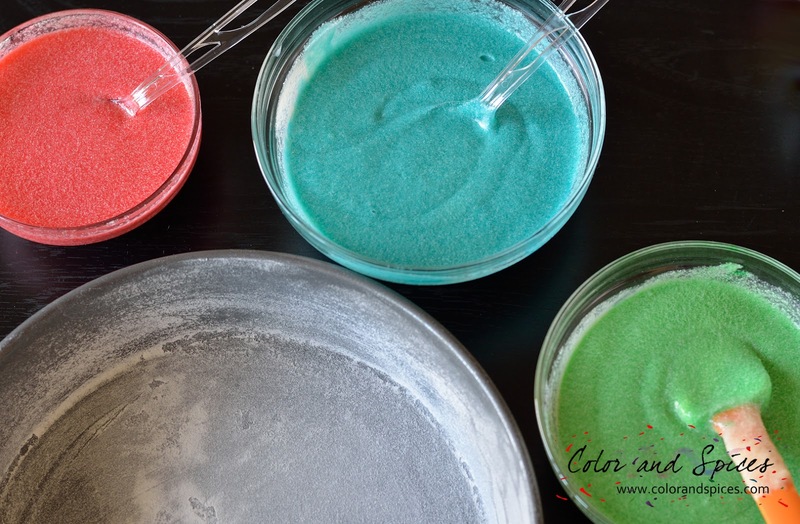 When all the flour is completely incorporated with other ingredients, divide the batter into different bowls, depending on the number of colors you are going to add. A bowl for each color. 8. I used 4 colors, red, yellow, green and blue. Mix well and make sure to use separate spoon for each color. 9. Take a 9 inch cake pan grease well with butter. I prefer butter for greasing the can pan, that gives the best result. After greasing the pan, dust the pan with flour. It should be well dusted, or the cake will stuck to the pan. 10. 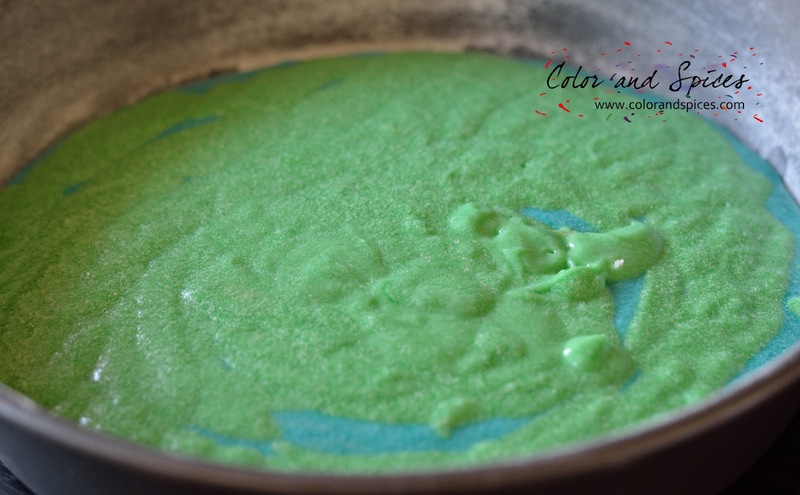 Pour one colored batter at a time to the greased and dusted pan. I started with blue, then green, next yellow and red at the end. Do as you like. 11. Put the cake pan in the preheated oven(middle rack). Bake for 30 min. Insert a toothpick at the center to check. 12. 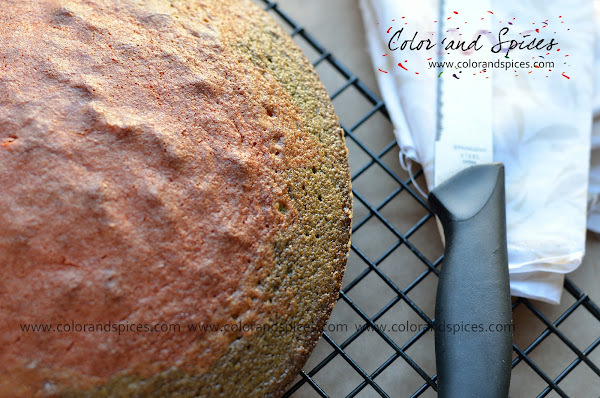 Take out the cake from oven, carefully flip it out of the pan and let it cool down on a cooling rack. After it cools down completely, you can do icing of your choice.